Used to control the flow of fuel oil to selected devices.The most typical application is to control the flow of oil from a pump set to one of several generator day tanks. • Optional Y-strainer ahead of the solenoid valves for protection of the valves and a spin on filter for cleaning the fuel. With these devices an optional differential pressure gauge and indicator can be added to trigger an alarm when the strainer needs cleaning or the filter changed. 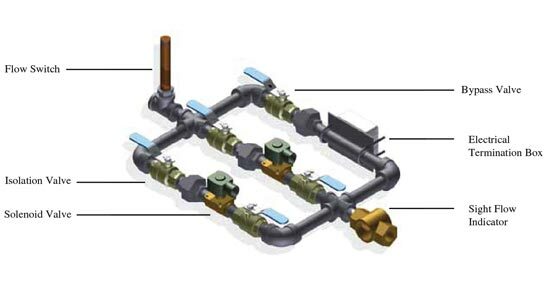 Note: Supply lines maybe larger than the flow control manifold because the flow control manifold only needs to be sized to handle the needs of the attached device.